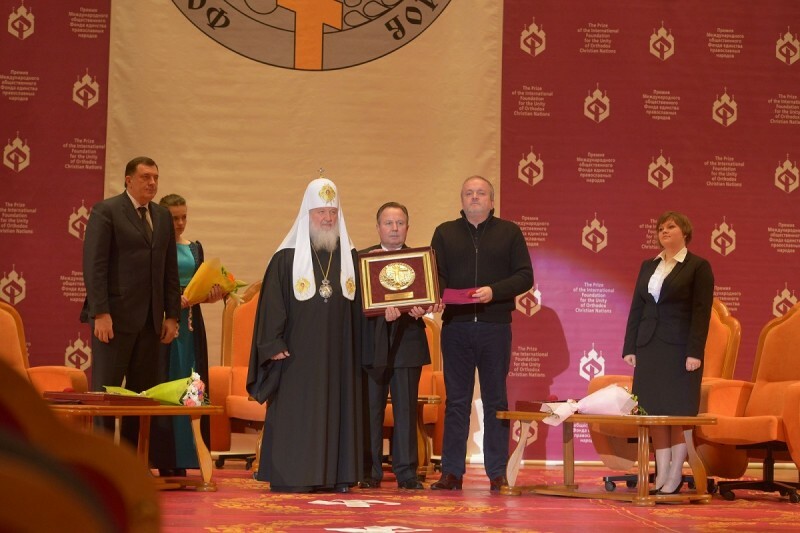 On March 11, 2014, His Holiness Patriarch Kirill of Moscow and All Russia led the 14th annual ceremony of awarding the Patriarch Alexy II Prize of the Unity of Orthodox Nations International Public Foundation granted for “outstanding work to consolidate the unity of Orthodox nations and to promote Christian values in the life of society”. 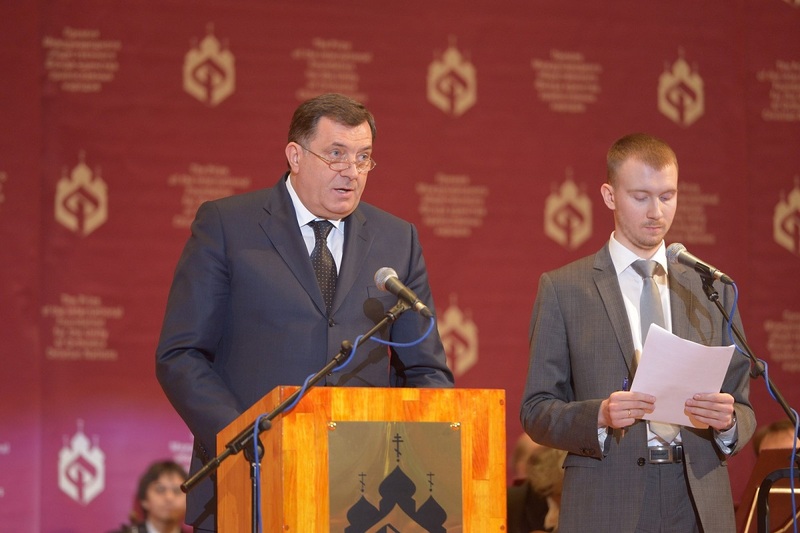 The 2013 winners of the prize are Mr. Milorad Dodik, President of the Republika Srpska (Bosnia and Herzegovina), the Day of the Baptism of Rus’, an international public organization, Ukraine, and the Fellowship of Orthodox Youth in Poland. After the show of a documentary about the Unity of Orthodox Nations International Foundation, its president V. A. Alekseyev made a brief introductory speech and invited His Holiness Kirill to the stage for the opening ceremony. Receiving the prize, President Milorad Dodik said in particular, “I am here first of all as President of the Republika Srpska whose people feel sincere love for Russia. Our country suffered such tremendous sacrifices to remain Orthodox that sometimes the terrible question arises: Is not the price too high? At such moments I feel joy that tells me that all the sacrifices and efforts were not in vain. Our God is the God of freedom. Our faith in God has made us freedom-loving people. If I were asked now when the world is gripped by crisis in all its manifestation, what is the meaning and goal of life for us as Orthodox nations, I would answer without hesitation: freedom… This high award gives me hope that together we will preserve freedom and dignity so important for us”. Ms Marta Czalpinska, who received the prize on behalf of the Fellowship of Orthodox Youth in Poland, noted that the high award was especially important since “our Church is not large and we do not have many young people. Still we seek to work from our hearts and with enthusiasm”. Stressing that the Fellowship was created by the youth and is governed by the youth, she said, “Youth is not the future of the Church but already its present”. In his speech, O. Krivoshey, leader of the Day of the Baptism of Rus’, who comes from Kiev, the baptismal font of all the peoples in historical Rus’ and the Mother of Russian Cities, shared his thoughts about the importance of preservation of spiritual unity. “The history of the Russian State is the history of the entire Holy Rus’, and whatever happened and happens in our Fatherland has always been dependent on the moral state that prevails in each and all of us. Already the first chroniclers in Rus’ wrote that any feud and weakening of the faith would inevitably inflict God’s wrath on the Fatherland, and this did happen as a heavy yoke fell on Rus’ to stay for several centuries. And it was only the spiritual rebirth initiated by St. Sergius of Radonezh and his disciples that delivered our people from slavery. All the centuries of our history, the times of trouble, wars, horrors and deprivations, the foreign yoke and the Russian people’s great victory over it – all this showed that the Creator put the immutable moral law in the foundation of history, and crimes against God and deviations from Him are inevitably punished, but for repentance and life with Him God gives a new dawn”. The present developments, he said, cannot be explained by economic and political reasons alone. “In Kiev today, we can see the struggle of the prince of this world against the Lord. His goal is man, God’s creation. Therefore, in these Lenten days, in this main church of the Russian World, we look to the future with fear and trepidation and expect the words: Christ is Risen, praying to the Lord with hope and faith that He may grant forgiveness and salvation to each of us, brothers and sisters, and to the whole great Russian people”. The ceremony was concluded with a concert given by Russian performers and teams who recited the masterpieces of Russian church and folk music and Russian and foreign classics.